The Ford Model A (also called the A-Model Ford or the A, and A-bone among rodders and customizers), was the second huge success for the Ford Motor Company, after its predecessor, the Model T. First produced on October 20, 1927, but not sold until December 2, it replaced the venerable Model T, which had been produced for 18 years. This new Model A (a previous model had used the name in 1903–04) was designated a 1928 model and was available in four standard colors. By 4 February 1929, one million Model As had been sold, and by 24 July, two million. The range of body styles ran from the Tudor at US$500 (in grey, green, or black) to the Town Car with a dual cowl at US$1200. In March 1930, Model A sales hit three million, and there were nine body styles available. Model A production ended in March, 1932, after 4,858,644 had been made in all body styles. Its successor was the Model B, which featured an updated 4-cylinder engine, as well as the Model 18, which introduced Ford's new flathead V8 engine. Prices for the Model A ranged from $385 for a roadster to $1400 for the top-of-the-line Town Car. The engine was a water-cooled L-head inline 4-cylinder with a displacement of 201 cu in. This engine provided 40 hp. Top speed was around 65 mph. The Model A had a 103.5 in wheelbase with a final drive ratio of 3.77:1. The transmission was a conventional 3-speed sliding gear manual unsynchronized unit with a single speed reverse. 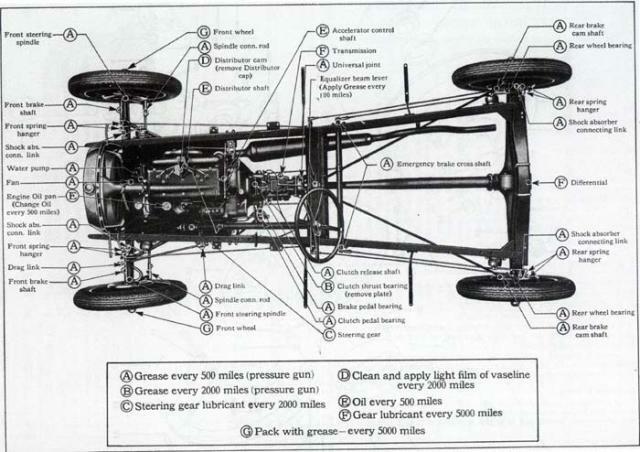 The Model A had 4-wheel mechanical drum brakes. The 1930 and 1931 models were available with stainless steel radiator cowling and headlamp housings. 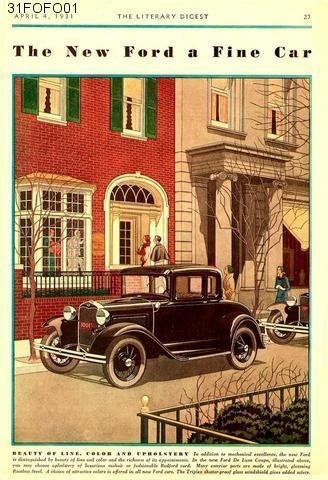 The Model A came in a wide variety of styles including a Coupe (Standard and Deluxe), the Business Coupe, Sport Coupe, Roadster Coupe (Standard and Deluxe), Convertible Cabriolet, Convertible Sedan, Phaeton (Standard and Deluxe), Tudor Sedan (Standard and Deluxe), Town Car, Fordor (2-window) (Standard and Deluxe), Fordor (3-window) (Standard and Deluxe), Victoria, Town Sedan, Station Wagon, Taxicab, Truck, and Commercial. 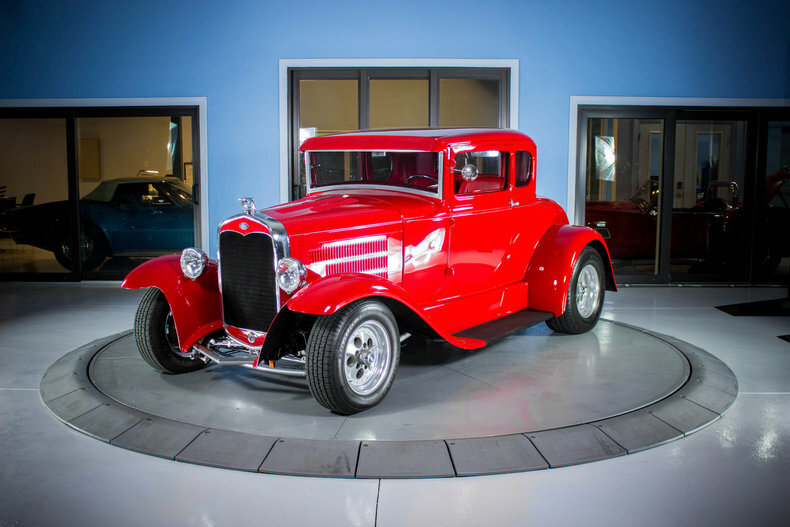 The very rare Special Coupe started production around March 1928 and ended mid-1929. The Model A was the first Ford to use the standard set of driver controls with conventional clutch and brake pedals, throttle, and gearshift. Previous Fords used controls that had become uncommon to drivers of other makes. The Model A's fuel tank was situated in the cowl, between the engine compartment's fire wall and the dash panel. It had a visual fuel gauge, and the fuel flowed to the carburetor by gravity. A rear-view mirror was optional. In cooler climates, owners could purchase an aftermarket cast iron unit to place over the exhaust manifold to provide heat to the cab. A small door provided adjustment of the amount of hot air entering the cab. The Model A was the first car to have safety glass in the windshield. In addition to the United States, Ford made the Model A in plants in Argentina, Canada, Denmark, France, Germany, Japan and the United Kingdom.